Miguel Fonseca will start his new job on October 1. 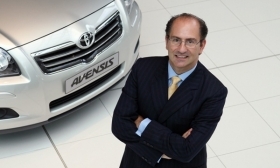 Toyota's UK chief, Miguel Fonseca, will be the new head of the automaker's European sales and marketing operations. Fonseca, 50, replaces Andrea Formica, who quit the Japanese company earlier this month. Sources say Formica soon will be named to head sales at Fiat S.p.A.'s auto division. Fonseca, a 50-year-old native of Portugal, has held senior positions with Ford of Europe and Fiat. He joined Toyota in 2001 as managing director of Toyota Spain, before being appointed to his current post of Toyota GB managing director in September 2006. Fonseca will start his new job on October 1. Jon Williams, 43, currently commercial director of Toyota and Lexus in Great Britain, will replace Fonseca as managing director of Toyota GB.